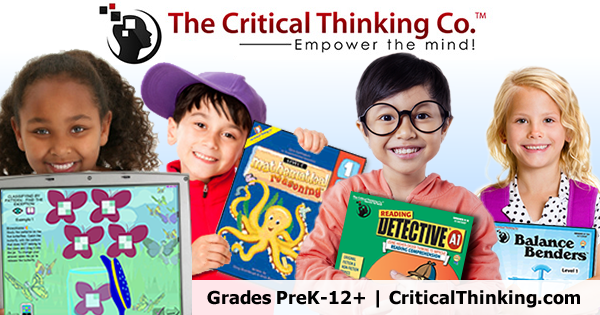 The Critical Thinking Co.™ has a ton of really awesome offerings. They blessed the crew with a few different choices and we were chosen to review Critical Thinking Detective Book 1. I chose to review this because I really thought it would help develop and strengthen executive functioning skills that we are trying to work on right now. We received the book in the mail, and immediately started working on it. Our Experience: The book is quite colorful, but not in a distracting manner. It is thin, but there are enough scenarios inside to really get a lot out of it. I would like to see perhaps a larger, more comprehensive book developed at some point, too, because Mr. B really enjoys these! Working at a pace of detective cases a week will put you at finishing this book in about two months time. The book is intended for grades 4-12+. I was a little concerned at first at how they could possible mesh such a wide age range together in one product but I have to say they did...and they did a great job doing so. As an adult, I have enjoyed using this as much as Mr. B! You read about a crime or situation. Within the paragraphs are clues that you must use to figure out "Who done it." It sounds like a simple task, but some of the clues are ambiguous and really take a lot of thinking power to come up with the correct answers. These are very similar to their Mind Benders (logic puzzles) but without the charts, and with more story line and plot. I really liked how we both had to really put on our thinking caps to figure out the stories. We were able to share laughs and giggles while both making mistakes. It was great to have Mr. B correct me and tell me WHY he thought his theory was more accurate than mine. By the middle of the book I could really tell that he was doing better in his abilities to read the clues held within the story, and use those clues to deductively choose a correct answer. Overall, I really like this a lot. Mr. B has really enjoyed it, and frequently started working on it on his own with no prompting from me at all. It's a very good supplemental book, and great if you kiddo is like mine and needs to strengthen his/her executive functioning and critical thinking skills. It really works well to help spectrum kids think more abstractly and less concretely, and helps them develop a greater detail vs. big picture ratio. I definitely recommend this to others! Does Critical Thinking Detective Book 1 Pass My 4 Ingredient Test? You can work at your own pace, and make adaptations as needed. For example, Mr. B and I would discuss the "Why" part of most cases instead of him writing out his explanations of how and why he came to his conclusions. I preferred this method so that I could make immediate corrections and guide him when needed so that he could make better sense of things. There are no hidden fees, and it does cover multiple grades. As for lasing a long time, not really. The book is only 32 pages so there aren't a great deal of cases. Working at a pace of 2 a week will take you about 2 months to get through all of it. Mr. B loves it. This held his attention, and he liked working in it a lot. He spent a long time on some cases, due to his own choosing. Please click below to read more reviews by The Homeschool Review Crew!